Imagine yourself a Middle Ages knight. Following a series of bloody Crusades, the embattled Holy Land is now in Christian hands, and you've been sworn to protect travelers on their dangerous pilgrimages to sacred sites in this newly opened territory. You'd likely depend on the deadly potency and stealth of a blade not unlike the Jerusalem Rose Short Sword. 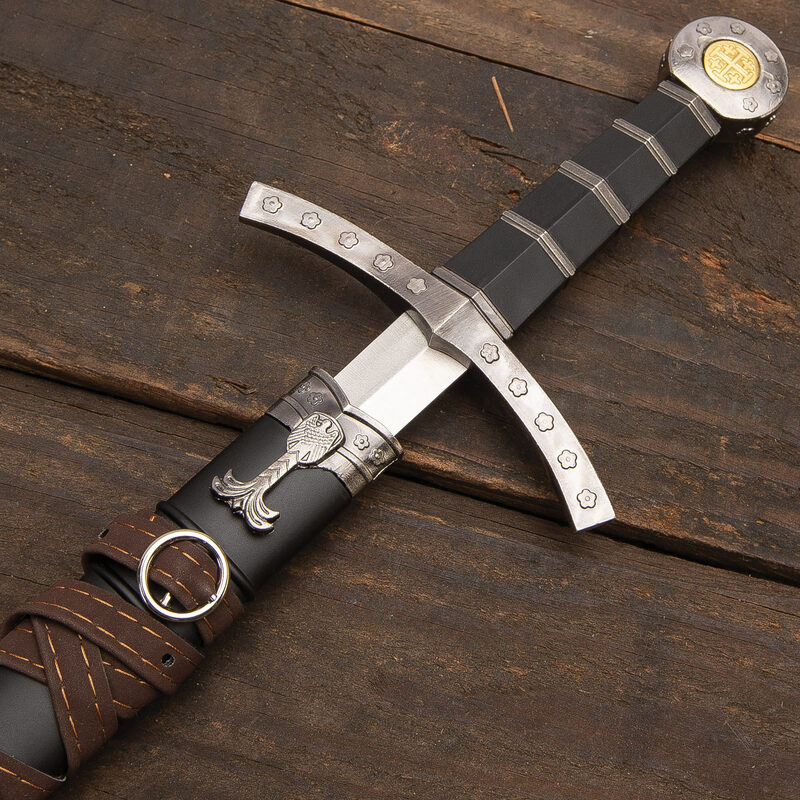 This striking daggeresque sword features authentic medieval symbols and a design that faithfully mirrors the small, easy-to-conceal swords of high Middle Ages knights, nobility and other well-to-do Holy Land travelers. At just 22 1/2" long, the Jerusalem Rose has a discreet profile that's well suited to hiding under a cloak or breastplate. But make no mistake - its double edged 16 3/4" stainless steel blade is razor sharp and more than capable of fending off lethal Ottoman assassins, crafty highwaymen and other threats on the road to the Middle East. The stately metal alloy pommel features the legendary "Jerusalem cross" - a common heraldic symbol donned by medieval crusaders - embossed in brass, encircled by charming rose badges in delicate raised relief. Rose emblems, a familiar household mark of some noble Crusades patrons, are echoed on the gracefully arched metal alloy guard. Even the Jerusalem Rose's scabbard boasts exquisite Middle Ages symbolism. The metal alloy sheath collar is ringed by more rose badges, offset by intricately detailed Eagle heraldic insignia. Soft faux leather bands envelop the regal sheath for a distinctive finishing touch. 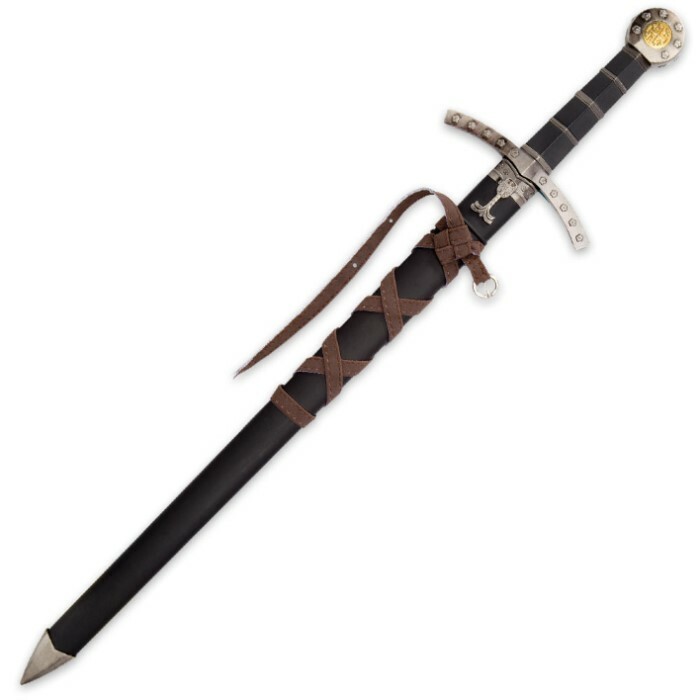 The Jerusalem Rose Short Sword is perfect for display, knife/sword collections, theater, cosplay or simply enjoying on its own. Regardless of what you decide to do with it, the Jerusalem Rose is sure to draw admiration and respect, just like the Medieval weapons it mimics. Great gift and nicely made. Quick delivery and always a good experience. This is a very nice light weight easy to wield short sword, somewhat sharp of box, especially one edge, good honing makes edges even better. Great appearance. Primarily a thruster and as such combat ready. Price makes it a real bargain. Got it today and for the price a nice piece. Good blade a decent edge on it. Fits great in the scabbard, which is very sturdy as well. 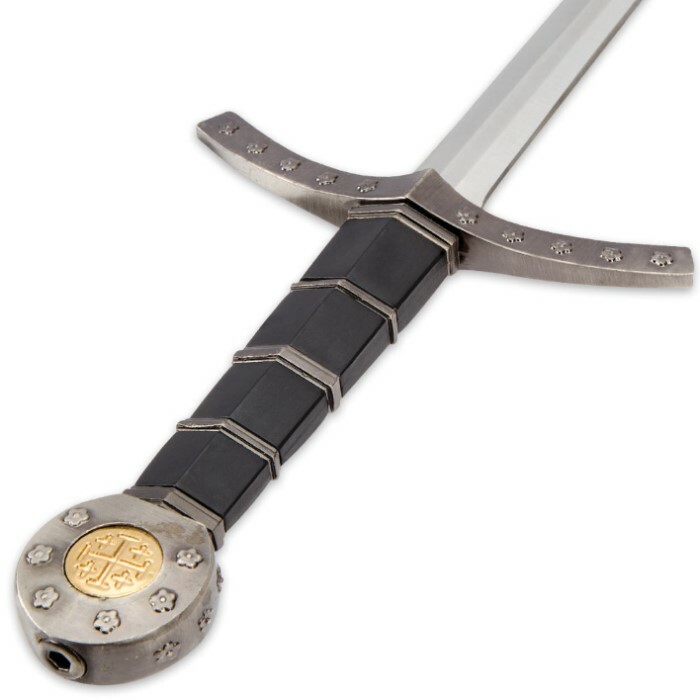 I recently ordered four of these Medieval Short Swords and when I received them I was not disappointed. The quality,price,and delivery time were all first rate.